If the "Zincs" of the Parisian Bistros could speak, there would be no better storytellers of fantastic stories of passions, conviviality, gastronomy and pleasures of the 5 senses . Zinc is like a symbol of all these memories where a concentration of authenticity, moods, fragrances and perfumes resonate that give women and men a feeling of fullness. 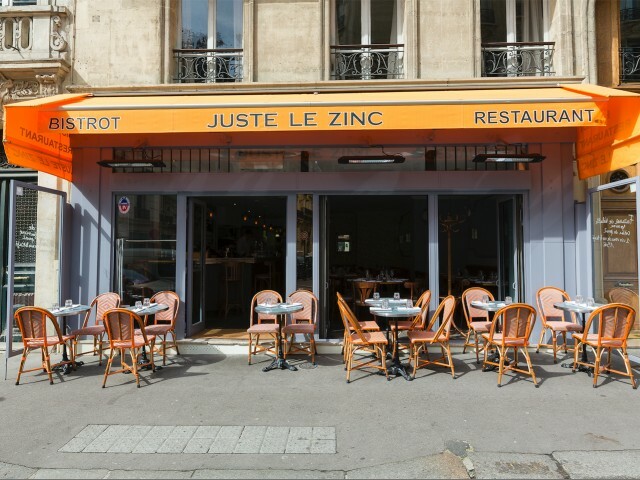 In the heart of the district of Europe / Batignolles, in the 8th arrondissement of Paris, "Juste le Zinc" revives this spirit and claims a taste for the plate, placing the customer's pleasure at the center of his approach. When you enter, you feel instantly in a friendly place where the contact is warm, where the kitchen warms the heart and the wine raises the soul. A place dedicated to the pleasure of the taste buds to quickly become the den of casual gastronomes . Nothing is left to chance , seriousness and meticulousness are essential values ​​in the kitchen but laughter and friendship resonate between room and kitchen to make the best place for the pleasure of being together. An association: Alain and Philippe who share the love of fine cuisine , one that revisits the flavors of yesteryear, the immortals, the undeniable. The flavors that have lulled so many Childhoods and which were elevated to the firmament by the "Grandmothers. Philippe's great-grandmother was a great cook ... Perhaps he had access to his secret notebooks? The reference leader, Alain Hacquard knows perfectly how to play the score of this Bistrot cuisine, restoring to him its letters of nobility, a finesse and an originality that elevate the debate. Terrine, cocottes, plancha ... Nothing resists him to deliver you the most beautiful flavors that will make you travel as the activation of your olfactive memory. A traditional cuisine that also knows how to surprise us but on the whole simple and beautiful things, cooked on the spot by a true Chef and that fits perfectly into a well-tended universe and tastefully decorated in the typical tradition of the Bistro. When one revisits the greatest classics with the concern for perfection, there is no greater joy than to rediscover all those flavors that have given so much pleasure to so many palates over time. Combine some notes of originality which aim to highlight the tasty peculiarities of these secular dishes by bringing them a touch of modernity while subliming the characteristics. On the map, you can find fresh products , available throughout the seasons and arrivals, selected if possible by respecting short and organic circuits. In order to connect the best products with attentive and assiduous customers. Building on strong relationships with carefully selected producers , there is no compromise on quality. JUST ZINC brings together simple products and a careful kitchen with a very reasonable price approach. With a card that changes every day impossible to get tired and it is the assurance of varying in pleasures guaranteeing quality. For appetizers, the "Carpaccio de Daurade with vanilla oil" subtly decorated with a note of lime, the Eggs in Meurette, the Terrine of Duck Foie Gras; The egg casserole with Foie gras or the flesh of Tourteau with avocado fondant. For dishes , the Parmentier de Beef Tender, the Cataplana Bar, the Steamed Codfish on Topinambour crushed or the Cote de Beeuf smoked with Beech wood. The desserts are ad hoc with Chantilly of Semolina with red fruits, the Floating Island with Caramel Salted Butter, Chocolate Mousse and its perfume of tonka, and all kinds of variations around the seasonal fruits. A great culinary culture leads the menu of our restaurant, which will allow everyone to find his account according to his taste and his mood. "What am I going to take?" "Or" it's always the same thing ", are questions that you will not ask anymore, there is nothing left but to let go.